These are two lines from the poem Leisure that have been embedded in my mind ever since we did the poem in school. It is so apt and so true for today. We are permanently connected to social media through our phones. We are always on the go. Fast food joints are thriving. We listen for traffic jams on the radio in order to avoid it. Stop. This isn't a rant post. In a world that is always in a frenzy, there are places of stillness that exist. I had the opportunity to visit such a place recently. 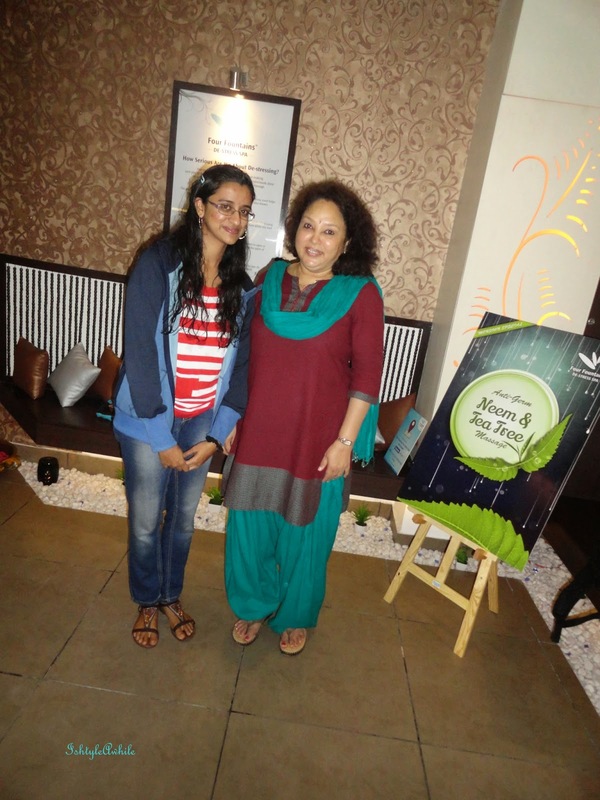 I was invited to visit the Four Fountains De Stress Spa in Bangalore. They have 8 centres in Bangalore. 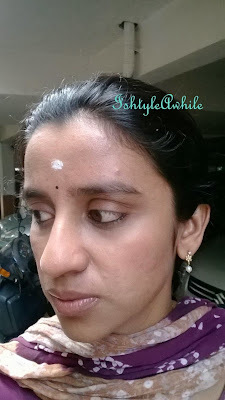 I chose to go to the Indiranagar one as it is the closest centre to my house. About Four Fountains De Stress Spa. I know most of you probably don't need any introduction to this place. 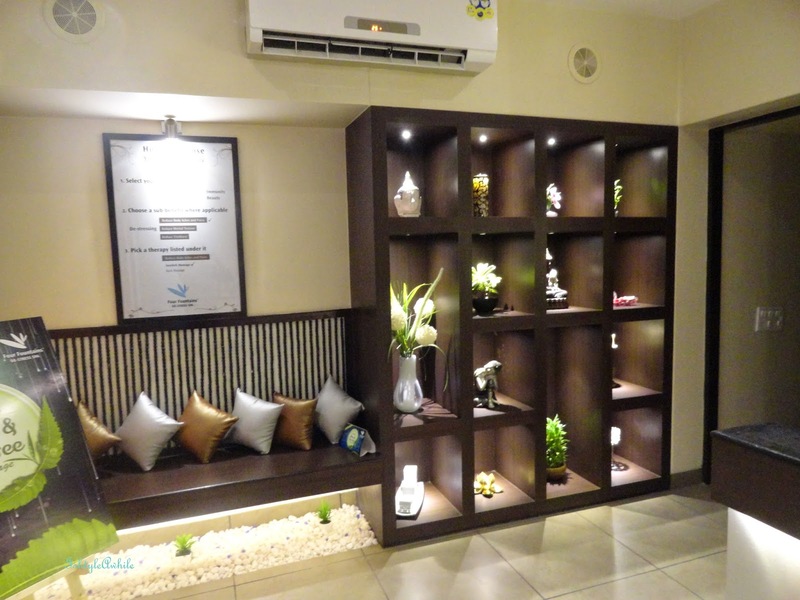 For the rest, the Four Fountains De Stress Spa is all about affordable spa treatments within the city. I was very fascinated to find that it was started by 3 men, 2 IIM- A and a SP Jain alumni. Kudos to them! It is on the main road, diagonally opposite to the KFC junction (CMH road). It was opened just 2 months ago. The building is still not completely occupied. 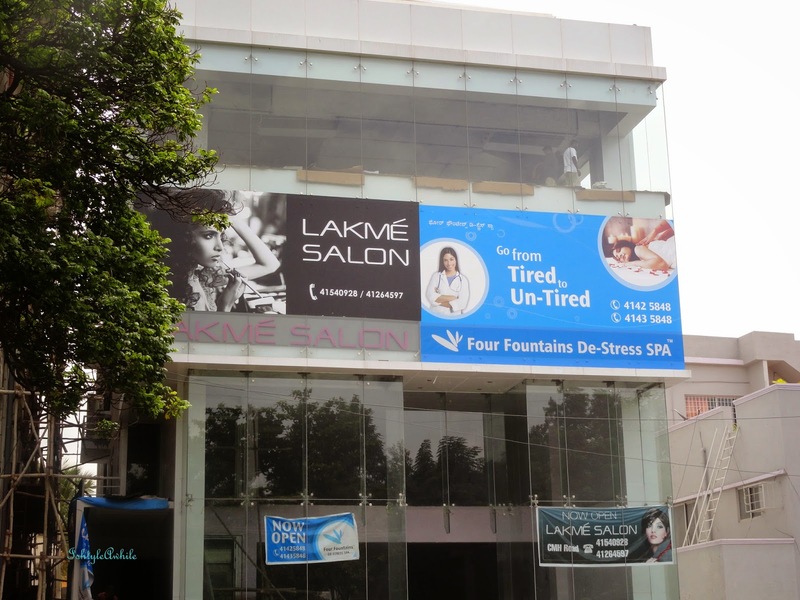 The Four Fountains Spa is found on the second floor and very conveniently there is a Lakme Salon on the same floor. 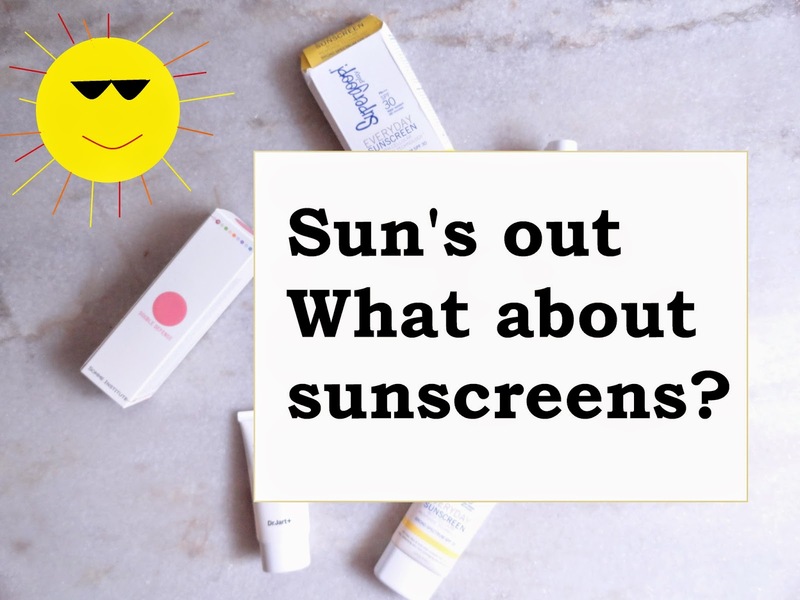 Talk about a one stop for all the beauty solutions. You are greeted by the aroma of lemongrass when you enter. It just diffuses through your system and starts to relax your senses. The lighting in the reception area is bright enough for you to read the various therapies but dim enough to make you feel sober. I love the small details like the decor and the seating in the reception. I was greeted by Raju. In fact, he called me about 15 minutes before my session was to start to check if I had any difficulty in finding the place. He also helped me to decide a therapy. I was offered a glass of water as I decided which service I wanted. 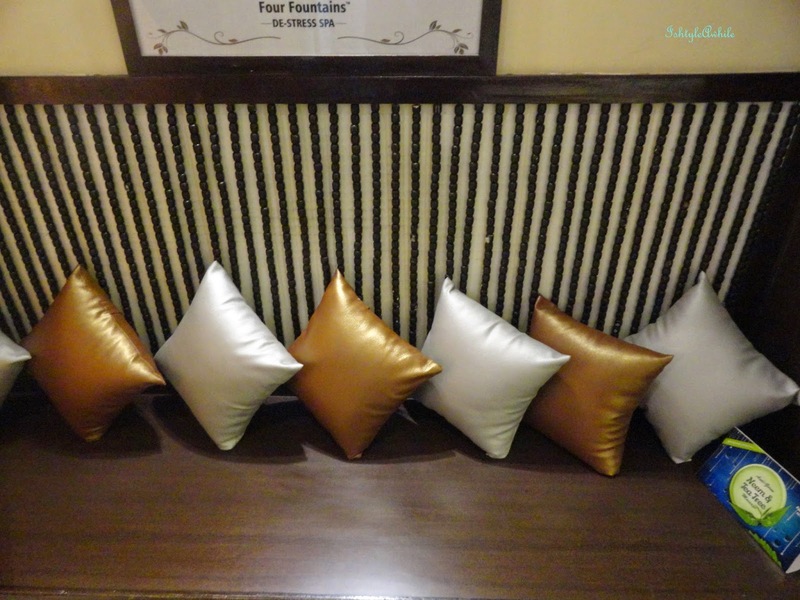 They currently have a monsoon special Anti germ Neem and Green Tea body massage. The massage room is small and cozy. 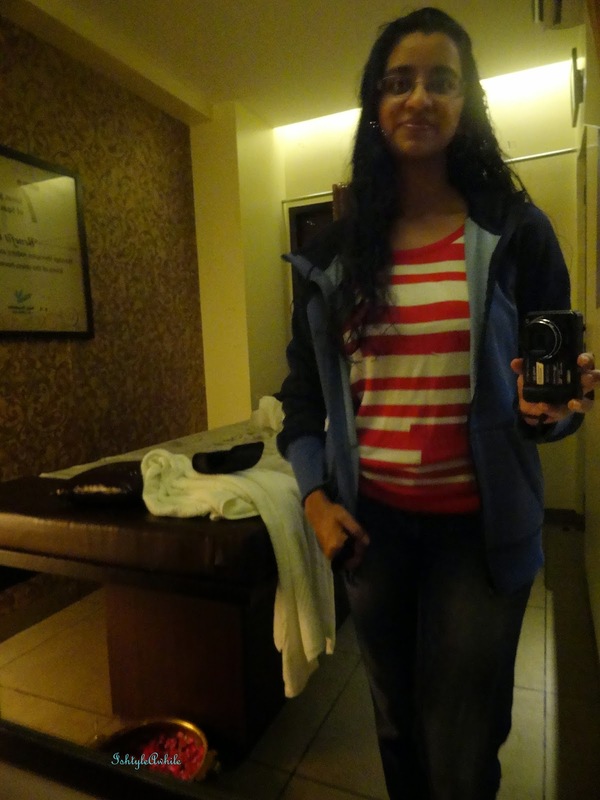 The last time I went for a massage therapy, the room was huge and a bit cold. This was just warm enough. The lighting in the massage room is dimmed and there are no harsh lights in your face at any point. The massage table is big. I think two of me could fit on it. I just wanted something to feel rejuvenated so I went for the Energising Aromatherapy. 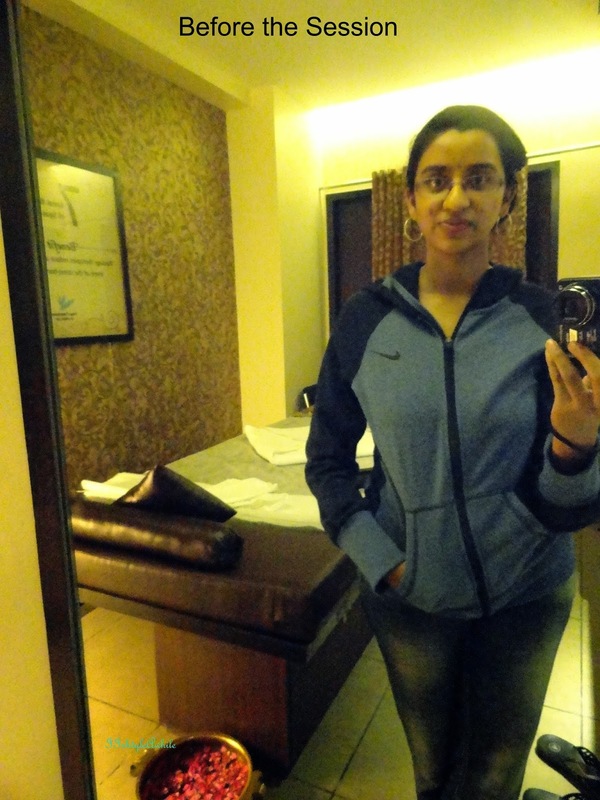 My masseuse's name was Meera and she was very deft. She was very courteous and kept checking with me if the pressure was fine and of the room temperature was fine. She wasn't overly chatty. The oils used for this therapy was lime, peppermint and grape. The scent of peppermint oil lingered on my skin till night. The massage was for an hour and I also got an extra 10 minute foot massage because I checked in on Facebook. The Indiranagar branch had this offer. I liked the fact that she kept me covered throughout except for the part that she was massaging. The oils used weren't heated. She didn't apply any oil to my face or my hair. She did massage my head and that was definitely the best part followed by the foot massage. She really hit the correct acupressure points on my foot. I could feel each muscle in my body just relaxing. She was gentle but firm at the right places. It was truly bliss. Once she was done, I had a shower. If you want a steam session you must ask for it. It is not part and parcel of the massage session. As this branch is a new one, there no doctor here yet. Also some of the services like Shirodhara are not yet available. Give it another month and everything should be in place here. I was a little disappointed at the lack of a doctor. I was kind of hoping for a full de-stress program with a diet and a regimen to follow. Oh well. Next time. 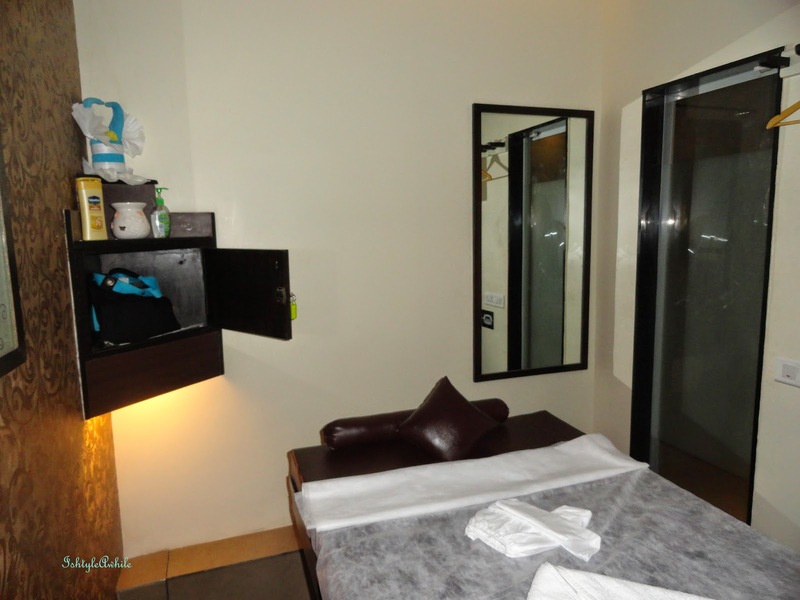 There are totally 6 rooms- 4 single rooms and 1 couple room. The rooms are all named. I was in Bliss. The locker that is given for you to keep your belongings is kind of small so don't carry a huge bag. I had a small tote which fit in perfectly. 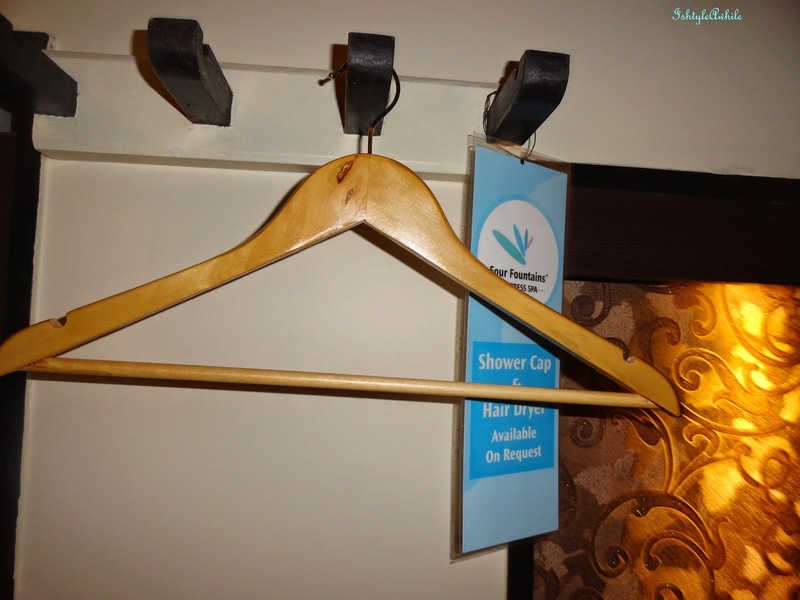 There is a hanger to hang up your clothes. There is a shower attached to the room. Apparently the steam session also happens in the shower cubicle but like I mentioned before it is an add on session. The shower is small. The hot water, is HOT! I almost got scalded. There is a bodywash and hairwash provided. 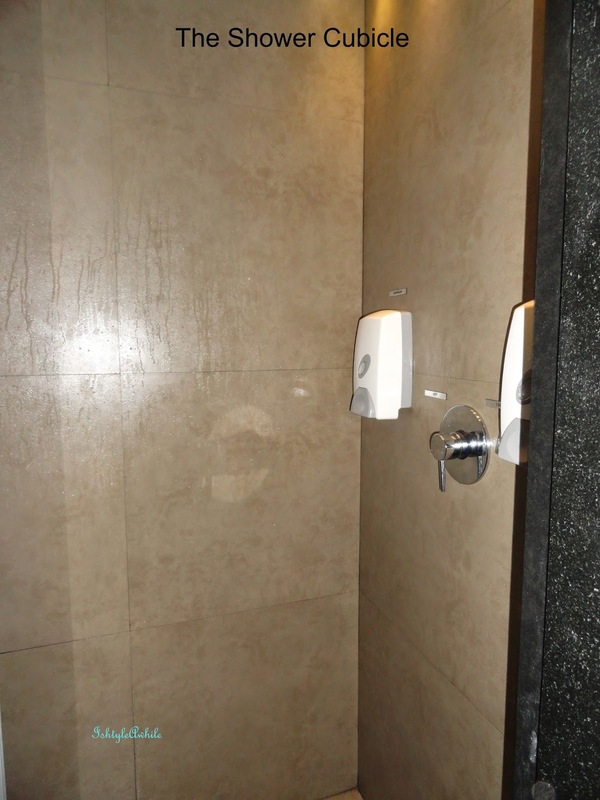 The shower cubicle is small so you may have not be able to get dressed inside it very comfortably. If you don't want to wet your hair, you can ask for a showercap. A hairdryer is also provided on request for those of you who want to dry your hair before leaving (In Bangalore weather that is advisable). A full length mirror is provided so you can take selfies, or just look at yourself before you leave. After the session. Do I look like I'm glowing? 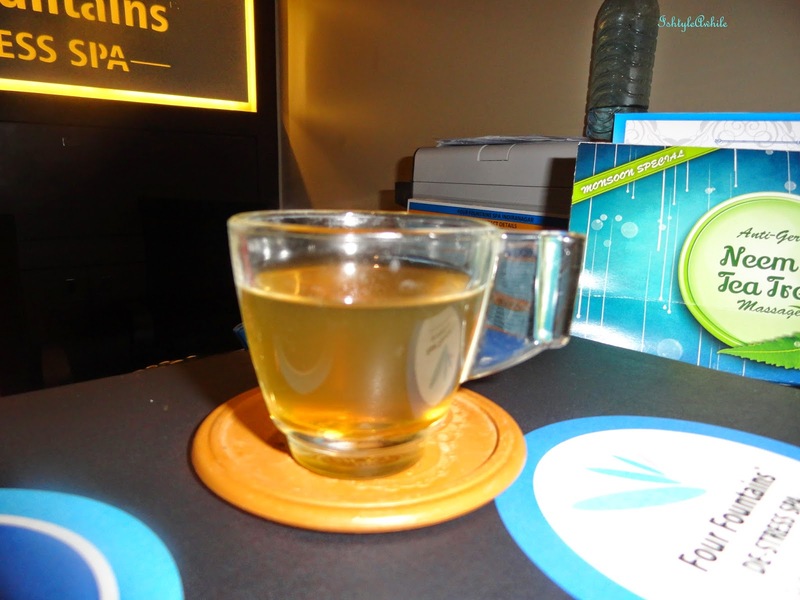 When I was done with the session, I had a small cup of green tea with honey in it and I filled out a feedback form. I also met the owner of this branch, Bhanu. She was really nice and we had a small chat about how she got the branch up and working. Lets drink to good health! They have a membership program that looked really interesting and if you sign up for it, even family and friends can use it. So if you can't afford it alone, pool in with a bunch of friends. They have services for corporate wellness which is really important. (My sister is a techie and I see how she neglects her health and well being). I also saw bride and groom services being offered. To summarize, I think it is important that everyone takes time off from the mundane routine and spend some time on themselves. Quality "me" time. I am really glad that I got an opportunity to do that on a cold cloudy Monday morning. It has really energised me for the weeks to come. I think all of you should definitely go for a session as well. P.S My bestie texted me after seeing my FB status and said she had been to the Koramangala one. Here is her review of it. "It was excellent. 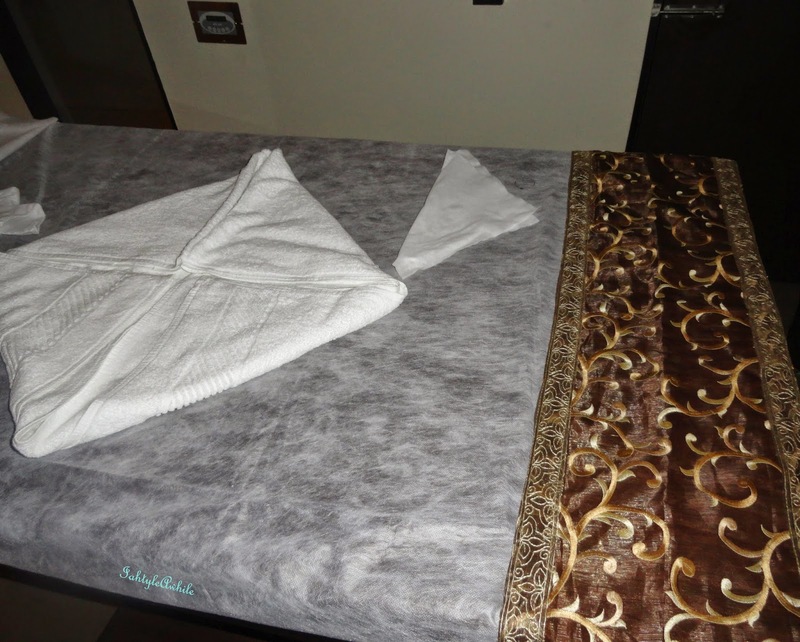 The place was clean and the masseuse was professional, and the massage was perfect. Four of us had gone and two of them took membership after, and have been using the spa ever since"
*The service was offered to me by the spa for review. However my opinions are honest and unbiased. 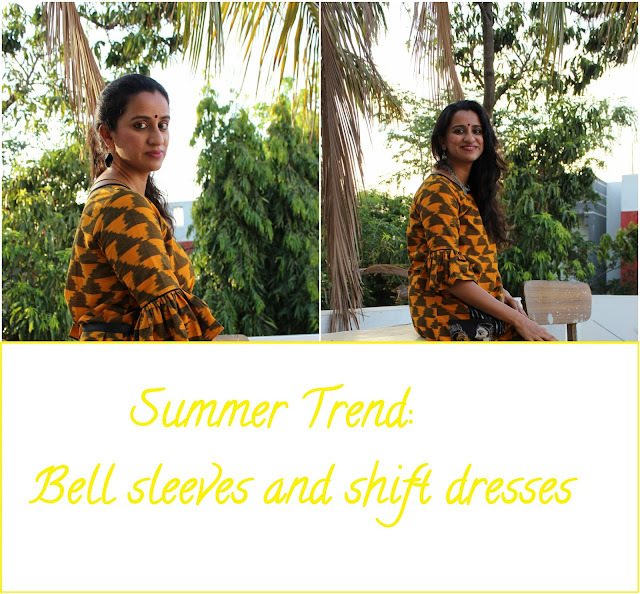 Bell Sleeves and Shift Dress from Howrah Bridge.